Construction Of Ama Yang-Ri (Ama Yangri Protector of entire Hyolmo valley ), 'Yang Rill Mountain' , is known fondly to the local villagers as Ama Yangri, meaning mother Yangri. Ama Yangri is considered to be a dakini, who, by power of her compassion, has become a goddess protector of the entire region. Locals born under her shadow grow up depending on her blessings. Looking upon her mountain form offers the viewer blessings for long life and freedom from accidents. When parting she is the final face villagers look upon, hoping to impress her form in their minds so that they can draw upon her memory in times of need upon return they prostrate before her in thanks for a safe journey and for comfort in the enfolding arms of her forests. Yearly, on the full moon of Chaitra (March or April) a big festival is held in her honor, to pay homage to her presence, in thanks of her protection and in hopes of success for the following year. Sherpa (Hyolmo) peoples from all over the region climb to the summit before the break of day in order to greet the rising sun. Local lamas lead a morning long Puja and from the afternoon into the evening the local people lead the community in dance. Following local Sherpa (Hyolmo )tradition, Raksi (corn ,apple wine) ,Chang (barley beer) and Traditional butter tea flow freely. At moon set Ama Yangri is left alone again, with only the echoes of laughter and singing interlaced with the spiraling smoke of incense as her offerings. layers of old leaves in search of fodder. He is a leftover, a relic from last year's yak herder migrations in late August, after the summer monsoons. Alone he guards the mountain, casting a quizzical eye upon all who pass by.The way of the pilgrims, through the large marsh-like pass (provided that environmental geography has changed little in the past 400 years) is the way of the old outer circambulation route, which few people still use. It circles the base of the mountain in an ever upward spiral where it eventually meets up with the modern path just below the summit. At this point the trail again turns left, ensuring another full circambulation before reaching the top. 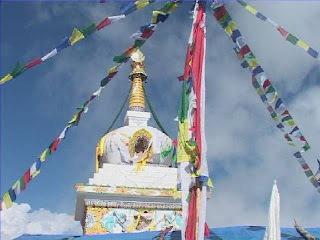 Crowning the summit is a large white chorten, circambulation of this completes the outer inner and sacred levels of the full cora route, important to all truly significant places of pilgrimage. From the summit the whole ridge of the Yangri Danda is visible in both directions. To the south the Kathmandu Valley unfolds like a scroll. On clear days and in the early morning the Great Stupa of Boudha is visible, its great dome seemingly suspended above its surroundings,due to the effect of its blindingly white base. To the north is Dawa Chati, consort mountain to Ama Yangri and hiding place for many term’s. Beyond Dawa Chati is the whole expanse of the Himalayas, with enough imagination one could almost see Everest far to the east.Steep valleys fall from both flanks, their depths not visible, but the sounds of their rivers stillaudible in the morning air.Directly below the summit on the western side, the 'marsh-like pass can be seen through a fringe of forest. Though dry in early spring when mountain snows have yet to respond to summer's warmth, the marshland soon becomes a lake after the monsoons.. This lake is the abode of Ama Yangri's mythological beast, a fierce serpent dragon. On the walls of theTarkye Gyang gompa she is portrayed in woman form riding this dragon.The summit is long and narrow, following the ridge it descends a few meters into a shallow basin, then rises again to a smaller, lower summit topped by a prayer flag and a few large flat rocks. On the southern end of the summit rests a large chorten surrounded by prayer flags.The whitewashed sides are cracked and damaged. Mortar has fallen out from between the stones, and the crown point, carved of yellow wood, is now housed in the small shrine inset on the southern face of the Chorten. Dried rhododendron flowers are stuck haphazardly in the cracks as offerings of physical apology for damage unattended. The Chorten has been hit several times by lightening, yet still stands, a silent sentinel to the passage of change. Below the chorten in the shallow basin between the two summits is the remains of a small meditation hut. One side is dug into the earth with piled rocks for added shelter. The other side is open to the endless expanse of mountain and sky. Locals hold it as a very powerful place to meditate. On the other side of the hut is a low spiky bush with katas (Throne) interwoven through its branches. Aside from grass it is the only vegetation on the otherwise barren mountainside. At the base of the bush is a pile of rocks vaguely shaped in the form of a frog. Inside and protected is a bare trickle of a spring. It offers only enough water to feed the sheltering bush and to keep the small stone in the center wet. It is said that if the stone ever dries out the gentle rains upon which the entire region depends will cease This small stone, called by some the weather frog, possesses powerful qualities in local legend. If touched by human hand bad weather will immediately descend upon the mountain top, be it rain, snow, hail, wind or a combination of all four. There are several stories in the villages about those who tested the 'frog', all with bad results. Legend holds that the spring was once upon a time much bigger, but that it has slowly decreased over the years. In 1723 a land grant, recorded on copper plate, was rewarded to Meme Surya Seng-ge, an well known yogin from the area, for services to the Malla king (Clarke). 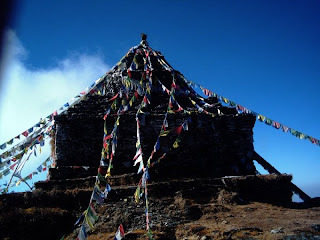 According to descriptions of holy sites and lists of localities established by Guru Rimpoche, he determined the summit of Ama Yangri to be the most auspicious place for a monastery. Upon this land he built a large monastery and temple complex, which was later destroyed by natural causes (Ehrhard).Local history tells the story of Meme Surya Seng-ge who came to the area with his wife and son, Tele Dudjoms (who was the final recognized incarnation of the Hyolmo Tulku lineage. Upon completion of the temple grounds it was revealed that the blessings of the area were so powerful that anyone looking upon the monuments would be immediately saved from rebirth in the lower realms. Soon after the consecration of the temple grounds lightening struck the area six times. No harm was done until it was hit a seventh time, whereupon the entire complex burned to the ground, leaving Meme Suya Seng-ge still meditating safely inside the ruins. The explanation for the distraction is that looking upon the temple was too easy an escape from rebirth in the hell realms. It was felt based on merit rather than upon the mere perception a great temple. At present all that remains of the once great monastery is the lonely white chorten, also cracked by lightening, and now desecrated, as couple of years ago one of the cracks was widened and the sacred relics and treasures within were stolen.It is unclear as to what buildings were upon the summit of Ama Yangri in 1629, as well as what happened to them. The text makes reference to Siddha Gyaltshen-bum, a disciple (follower) of Rigdzen Godem Thru-chen, a great Teton from the region, but no explanations or histories of his role at Ama Yangri are available. Another mention is made to the 'pure monk' Tsulthrin, who used to bathe a sacred bronze mirror;"...and now, as people visit these sacred representations, they all drink some of this bathing water, as a result of which they are saved from rebirth in the lower realms - thus it has been prophesied by Master Padma [Sambhava] . At this navel center of 'Helambu's fence of snowy peaks', The Siddha Gyaltshen-bum made a start with the building of temples and the rest, but due to obstacles that arose he could not complete the task"
Later on grand grand children of Meme Surya Senge-ge and their followers from Tarkeyghyang renovated Ama Yangri several times. Many pieces of the story are missing, but local histories and inherited memories only extend as far back as the early 1700's when villages first became established in the area. There is no proof have been found. Hyolmo Langra Gaybsa (present Tarkeyghyang village was established in time of Meme Surya senge-ge.Some other Hyolmo villages were already there before Meme surya senge-gel.It is clearly mention that Ama Yangri Gonpa (Monastry) was first Gonpa in the area and afterward Pema Chholin Gonpa (present Tarkeghyang monastry ) was built with Lamas. History mentions that Tarkeyghyang was established with eighty families with Meme Surya। Meme who was big Lama and to get teaching from him surrounding Hyolmo "Barus'' (Baru refers rich people in Hyolmo Language) migrated to Tarkeyghyang. That's how huge village in Hyolmo Tarkeyghyang established which is also Known as Langragyapsa. nice to know the history of yolmo from you...but reading your post i got something to ask you...you had posted yolmo as a vally...but as far as my knowledge vally is"a low area of land between hills or mountains, typically with a river or stream flowing through it. "(oxford dictionary)then how can be the yolmo region be valley...as our history calls it as "yolmo gangra" which means hill..plz feel free to clearify me..